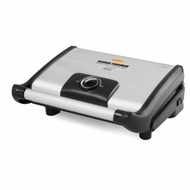 Create nutritious meals in minutes for the whole family with the George Foreman 80-sq in Grill. Its patented slope helps knock out the fat as you cook. A nonstick coating lets you cook oil-free, while the variable temperature control allows for precise cooking versatility. This grill features an adjustable cooking height hinge for cooking juicy burgers or thick sandwiches. The dishwasher-safe grease tray helps make cleanup a snap.